held from 5th -19th November for two weeks at Bodhgaya. Kyabje Kalu Rinpoche and Kyabje Bokar Rinpoche presided over this Monlam which was attended by some two hundred ordained monks. The Third Jamgon Kongtrul Rinpoche also came for one day. 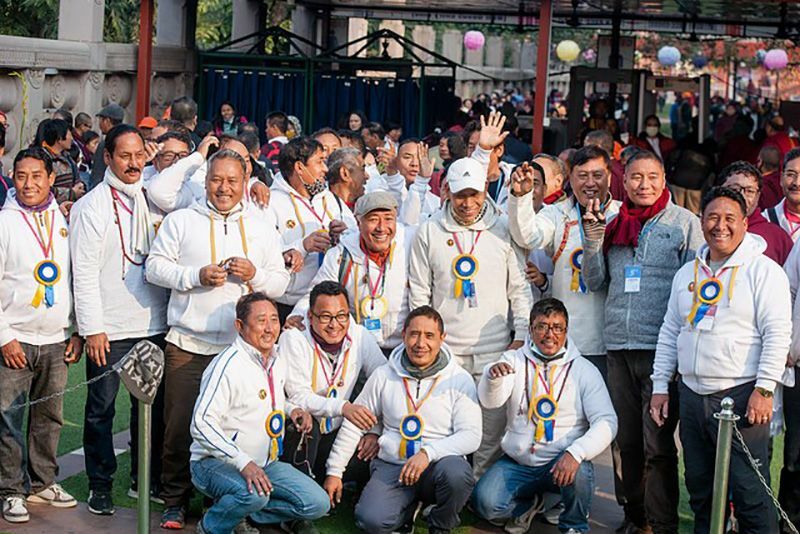 a two week-long Monlam, held in November, was attended by a good number of monks and pilgrims. a two week-long Monlam was held in November like the preceding year. monks and pilgrims gathered for Monlam at the end of the year, led by Kyabje Bokar Rinpoche. held for three weeks from 30th December. Kyabje Kalu Rinpoche and Kyabje Bokar Rinpoche presided over this Monlam, which was attended by lamas and monks. They made offerings. The Twelfth Situ Rinpoche also made an appearance. Monlam was held at the end of the year, presided over by Kyabje Kalu Rinpoche and Kyabje Bokar Rinpoche. since Kyabje Kalu Rinpoche had passed away, Monlam was held at his seat in Sonamda. Kyabje Bokar Rinpoche was travelling abroad and could not come for the Monlam, but gave instructions to Lama Choedrak who organised the Monlam at Bodhgaya. It was attended by a good number of lamas, monks and pilgrims. Monlam was organised in the same way as the previous year. held from 18th November for ten days. Kyabje Kalu Yangsi Rinpoche and Kyabje Bokar Rinpoche presided over this Monlam. Over two hundred ordained monks attended and made elaborate offerings. held from 14th December for ten days. It was attended by Kyabje Kalu Yangsi Rinpoche, Kyabje Bokar Rinpoche and over two hundred ordained monks. Kyabje Bokar Rinpoche was abroad at the time but gave instructions that the Monlam be held as usual and it was attended by a good number of lamas, monks and pilgrims. held from 1st December for seven days. Kyabje Bokar Rinpoche presided over this Monlam. It was attended by over one hundred monks, nuns and pilgrims. Samantabhadra prayers and Praises to Tara, and the reading of the Kagyur. Finally, an elaborate Pakshi-La-Drup tshog offering marked the end of Monlam. held from 28th November for ten days. Presided over by Kyabje Kalu Yangsi Rinpoche and Kyabje Bokar Rinpoche, over three thousand monks and nuns of the Kamtshang Kagyu lineage from India, Nepal and Bhutan gathered for this Monlam. Like the previous year, elaborate prayers were organised for the well-being of all beings and particularly for the long life and flourishing activity of the Seventeenth Gyalwang Karmapa. 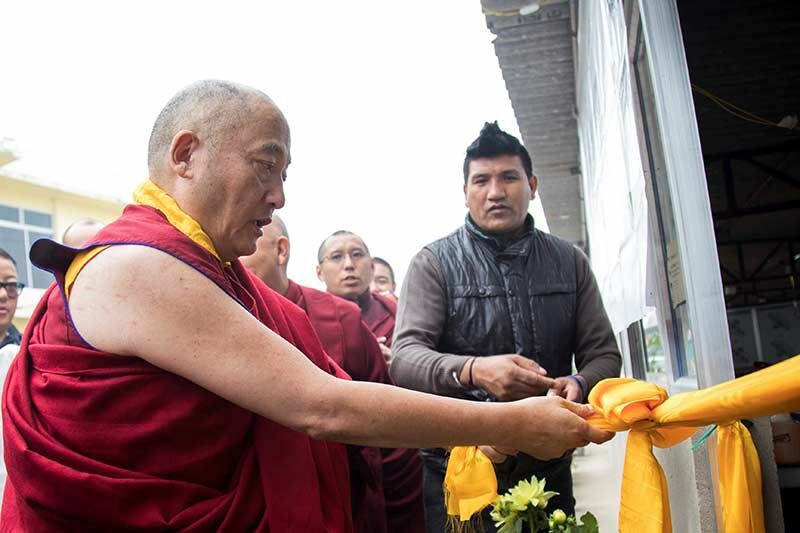 Monlam was formally re-named as the Kamtshang Kagyu Sangha Monlam. held from 26th December for ten days. Under the blessing umbrella of Kyabje Kalu Yangsi Rinpoche and Kyabje Bokar Rinpoche, over two thousand monks and nuns assembled for the Monlam. held from 12th December for eight days. Kyabje Bokar Rinpoche presided over five thousand monks and nuns, assembled for the Monlam. His Holiness the Dalai Lama presided over one whole afternoon session on the eighth day. He gave the transmission of a special, non-sectarian Monlam text for the flourishing of the Buddhist teachings, which he himself had composed, Rime Tengyal Monlam. He also gave an address on what is to be abandoned and what is to be cultivated. presided over by Kyabje Bokar Rinpoche, over one thousand and five hundred monks and nuns attended the Monlam. held from 13th December for eight days. This elaborate Monlam was the first to be presided over by Pal Gyalwang Karmapa Ogyen Trinley Dorje, along with the Third Kyabje Jamgon Kongtrul Rinpoche and the Twelfth Kyabje Gyaltshab Rinpoche. Over three thousand sangha members, monks and nuns, assembled for this Monlam. Pal Gyalwang Karmapa began teaching the Jewel Ornament of Precious Liberation and also bestowed a long-life empowerment and precious advice. held from 31st December for eight days. Pal Gyalwang Karmapa presided over this Monlam and there were over five thousand attendees, both monks and nuns. Pal Gyalwang Karmapa gave advice for the benefit of both sangha and lay community. His Holiness the Dalai Lama blessed the Monlam by presiding over the tshog offering on the last day. held from 30th December for eight days. Over two thousand monks and nuns attended. Pal Gyalwang Karmapa continued his teaching on the Jewel Ornament of Precious Liberation. He and Kyabje Bokar Rinpoche together re-named Kamtshang Kagyu Sangha Monlam as Kagyu Monlam. held from 19th December for eight days. 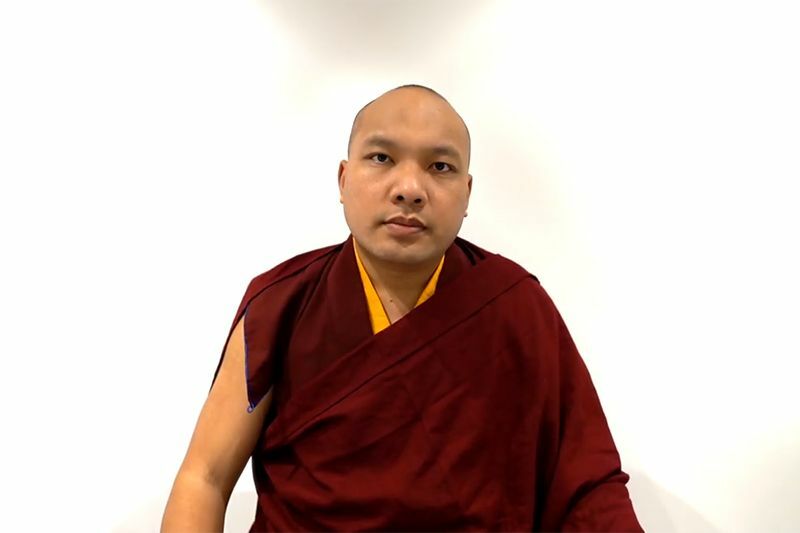 Because Kyabje Bokar Rinpoche had passed away, Pal Gyalwang Karmapa took charge of Monlam in the interest of the teaching in general and particularly for the continuity of the Monlam. He prepared a code of conduct and dress for monks and nuns in accordance with the Vinaya tradition. Over three thousand monks and nuns attended the Monlam and recited the Monlam Ritual Prayers composed by the Seventh Karmapa. The alms gathering procession was held for the first time. because of the nature of the Tibetan calendar, 2005 and 2006 Monlams were held in the same year. 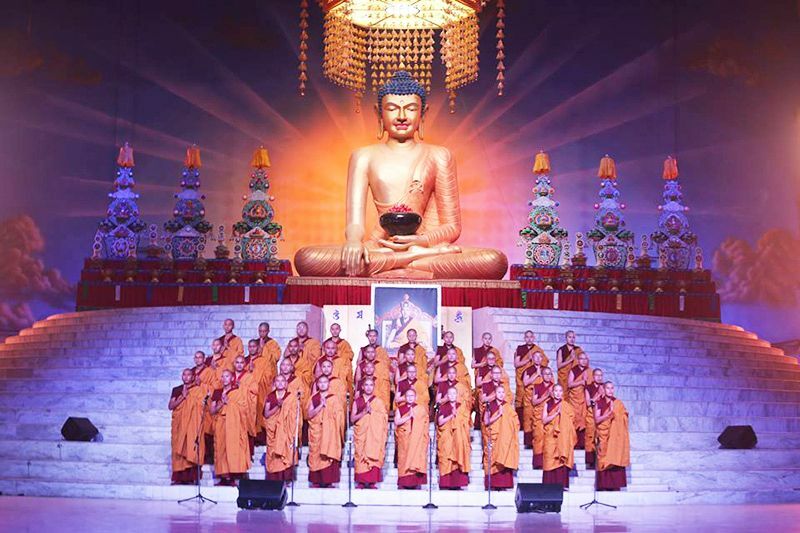 The 2005 Monlam was held from 7th January 2006 for eight days.It was presided over by Pal Gyalwang Karmapa and attended by over three thousand monks and nuns. He revived the tradition of setting up an elaborate altar with huge butter sculptures of Marpa, Milarepa, and Dagpo. He specially commissioned statues of these three fathers of the Kagyu lineage from Nepal, and distributed them to all Kagyu monasteries and centres worldwide. 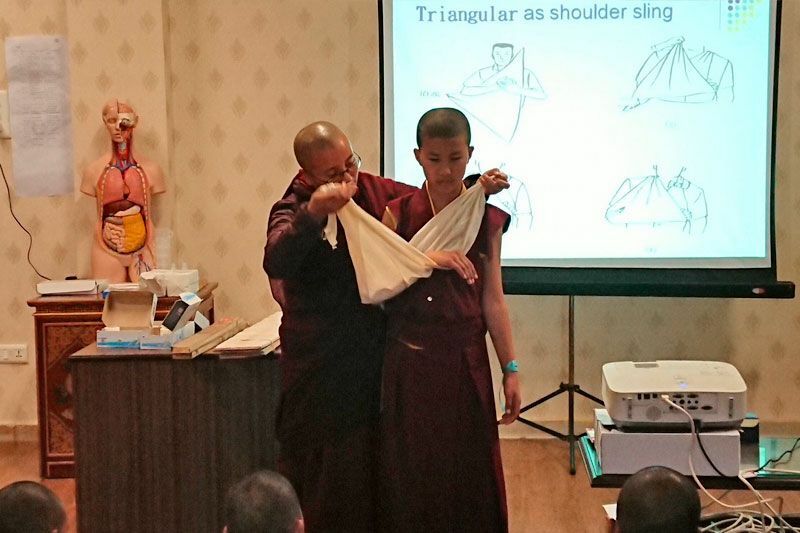 In addition, he concluded his teachings on the Jewel Ornament of Precious Liberation. held from 27th December for eight days. Pal Gyalwang Karmapa set up a network of teams to make the preparations for Monlam and appointed heads and deputies to supervise them. He presided, along with many senior lamas and tulkus. Over five thousand monks and nuns attended the Monlam. Pal Gyalwang Karmapa began teaching on The Life of Milarepa.